Sort file:- Sandwich, January, 2019. Above photos by Paul Skelton 14 January 2012. 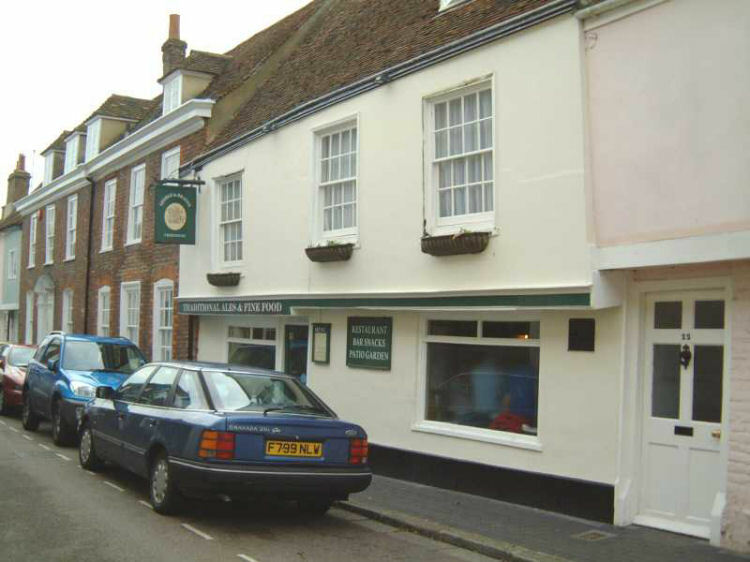 Above photo shows the George and Dragon in Sandwich. Photo taken from http://www.roundsandsounds.co.uk circa 2008. I have reference to a "Green Dragon" also in Fisher Street, which may have been an error in the Post Office directory of 1878 when John Burchett was serving behind the bar. I am assuming that this is the same pub. This inn was built in 1446, the 24th year of the 1st reign of Henry VI and was part of the estate of Peter Taychell, who possessed many mortgages in Sandwich, Ash and Wingham. In the 1570 ale was brewed here under licence for one Stephen Back. In 1615 one Francis Scoones came to the house in that year he registered the house under the name of “George and Dragon”. It is said that since the opening year, the pub has never been closed once due to wars or change of breweries etc. 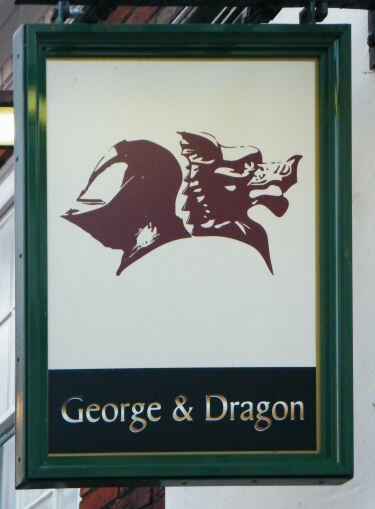 In May 2008 the George and Dragon was taken over by brothers, Mark and Matthew Philpott, born and bred in the town. Mark is the chef who studied catering at Thanet College for 3 years. He then moved onto London, and spent 11 years working in a number of kitchens. These include the Georgian kitchen at Harrods, Leith's and Adam Street. Matthew, the other brother, worked in London a few years, then moved to Surrey where becoming manager of the Brickmakers Pub in Windlesham for 3 years. Very recently, The George and Dragon were honoured with the award of becoming a Cask Marque accredited pub. THE "George and Dragon" may be tucked away in a pretty back street of Sandwich, but its fame for excellent food is spreading fast throughout East Kent. Liz Tillings is now the landlady and has joined forces with John Radford, now the landlord to provide a bright future for the Fisher Street pub. Under Liz and John's guidance, there has been a pleasing transformation in the ancient building in less than a year. A bright and spacious restaurant has been created at the back of the pub, with many seats at the pine tables providing an opportunity to see the chef at work in his kitchen. There is also a pretty garden, which is a sun trap, and later in the summer an opera duo will be performing at a special Italian evening. The pub is also visited by the Deal-based theatre group the Crew of Patches during its Bite of Sandwich tours. "We took over the "George and Dragon" with a vision to have more than just a pub and more than just a restaurant. There has been an amalgamation of the two," said Liz, who describes the new look business as a little jewel of a back-street pub. "I still consider it to be a pub. We sell real ale, have guest bitters and are very busy with people who are just drinking. Liz and John and now discussing changing the menu which is altered every four months. There are always impressive meat and fish specialities, always duck and chicken dishes, and all the vegetables are fresh. A wood-burning oven was brought to Sandwich in pieces from Italy to be reconstructed at the "George and Dragon" and the range of 11 pizzas presents a first class choice. Starters and sweets are also tempting the range of salads has wonderful dressings and at lunchtimes the char grilled baguettes offer a quick lunchtime snack with a difference. About 35 people can be seated in the restaurant and Liz is keen to promote its "woman friendly" atmosphere. The revamped pub also has a cellar room for private parties or business lunches. Sunday lunchtime provides a speciality at the "George and Dragon," when apart from the usual full al a carte menu there is also a chance to try the carvery, complete with roast beef, Yorkshire pudding and all the trimmings. On Sunday evenings only pizza, salads and desserts are served. The pub also has a range of coffees to suit every taste. 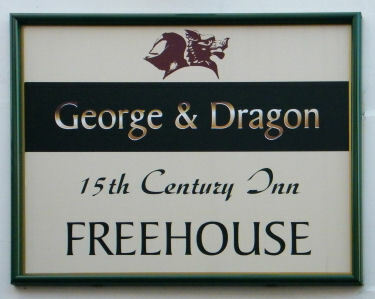 The "George and Dragon" is a two minute walk away from free parking at The Quay and is closed in the afternoons. From the Dover Express, 27 July 2017. By Lauren MacDougall. Restaurateur suggests critic may have been ‘too full’ to appreciate his dinner. 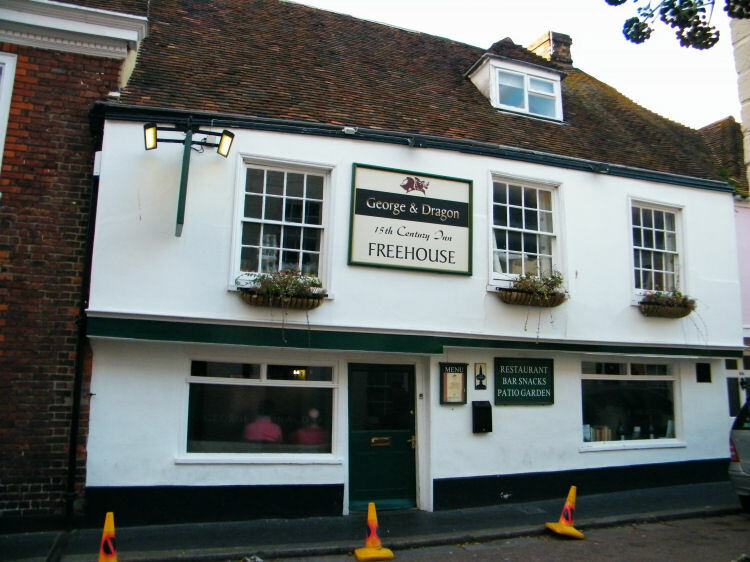 THE George and Dragon in Sandwich has garnered a great reputation in both the town and wider Kent over the years. The Dover district pub prides itself on serving some seriously tasty grub, offering a traditional menu packed full of British and world cuisine. But despite an average rating of 4.5 stars out of 5 on the tourism website TripAdvisor (based on more than 600 reviews), making it the top eatery in Sandwich and one of the best rated dining establishments in the whole county, the restaurant is not without the occasional online critic. While many restaurateurs choose to ignore the bad reviews, one of the pub’s owners, Matthew Philpott, took issue with a couple, writing some epic and sassy comebacks to the moaning diners. One critic with username “Dean C” left a review in May this year, giving the restaurant just two stars. He complained: “Had heard good things but found both starters and mains very uninspiring and at best average. Matthew replied: “Dean, not sure what to say about your review as it does not really tell us much about your experience or why you were so disappointed. After taking a snoop on Dean’s TripAdvisor profile - and discovering that he had also left a (positive) review for another Sandwich restaurant, Luigi’s, on the very same day, Matthew ramped up the sass. This is not the only time the pub owner has taken to the keyboard to defend his business. Another user left a scathing two star review in March, titled “Don’t get it”. Matthew replied: “I do not get why people are so very happy to go on social websites like TripAdvisor to post their negative views rather than speak to us at the time. “If you were able to speak to us we could of attempted to correct any mistake or disappointment you may have with your service or meal. 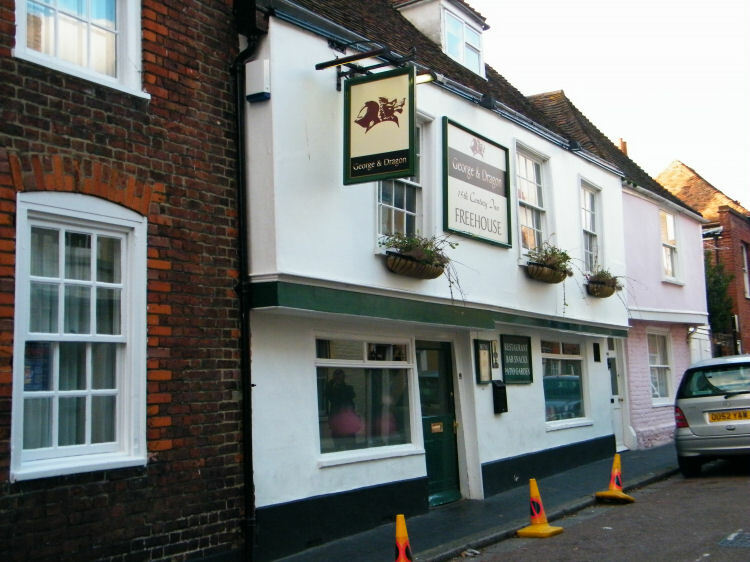 In 2008 the George and Dragon was taken over by Matthew and his brother Mark, when they returned back to the town in which they were brought up. Mark, the chef began his career by studying catering at Thanet College for three years. He then moved to London, where he spent 11 years gaining valuable experience working in a number of kitchens, including the Georgian kitchen at Harrods, Leith’s and Adam Street. And Matthew, after working in London for a few years, moved to Surrey where he became the manager of the Brickmakers Pub in Windlesham for three years. Both brothers hope they can use the skills they have gained, to give every customer an enjoyable and friendly experience at the George and Dragon.